This was an 18-hour Wilderness First Aid course sponsored by the Climbing Section of the Chemeketan outdoor club. The course was conducted on a snowy weekend February 25-26, 2012 at Silver Falls State Park a(8 am to 7 pm on Saturday and 8 am to 5 pm Sunday.) 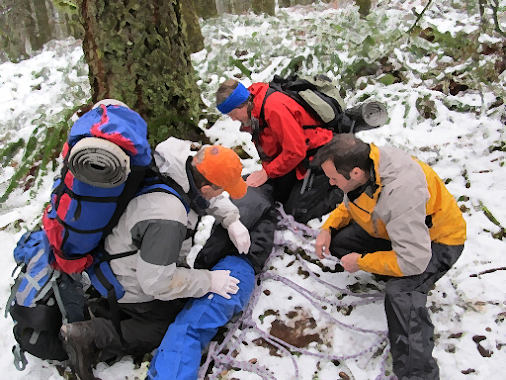 The course covered practical skills and decision-making using realistic emergency medical scenarios (See pictures below) as might be encountered on a climbing, hiking or backpacking trip in the Cascades. This was a fun, intense, hands-on course that includesdoutdoor scenarios in the dark and in cold, wet, winter conditions. Course Text book Buck Tilton's "Backcountry First Aid" prior to class. See below for ordering information. Provide your emergency contact information to Mike Niemeyer. Sign a class agreement and release form and bring the form with you to the first class. You will need a watch that displays seconds and a headlamp. Bring snacks and meals for both days (we won’t be feeding you). We will have a kitchen facility available with a sink, microwave, fridge, stove, etc. Bring a day pack or backpack that can get knocked around a bit – with supplies you’d typically bring on an outing. Bring an extra thrift-store quality shirt and pants/sweat pants – should you volunteer to be a patient in a scenario. A small foam pad is optional - something for you to sit or kneel on when you are outside assisting a patient. Wear/bring warm clothes and a waterproof shell layer or rain pants/coat. Bring a towel or rags to dry yourself off as we come in from outside scenarios. Cost is $45 (Mainly to cover the cost of expendable first aid supplies students will use in the training.) Students will need to purchase the textbook on their own (about $10). You are on your own for meals. A State Park parking pass is also required ($5/day). Payment is required to confirm your reservation. Email Mike Niemeyer to register. Course Wilderness First Aid Report form and Checklist - We will be including this form in your first aid kits for use during the class scenarios - its a good idea to get familiar with it before class. The form should be printed 2-sided and folded twice so the numbered pages open in order. 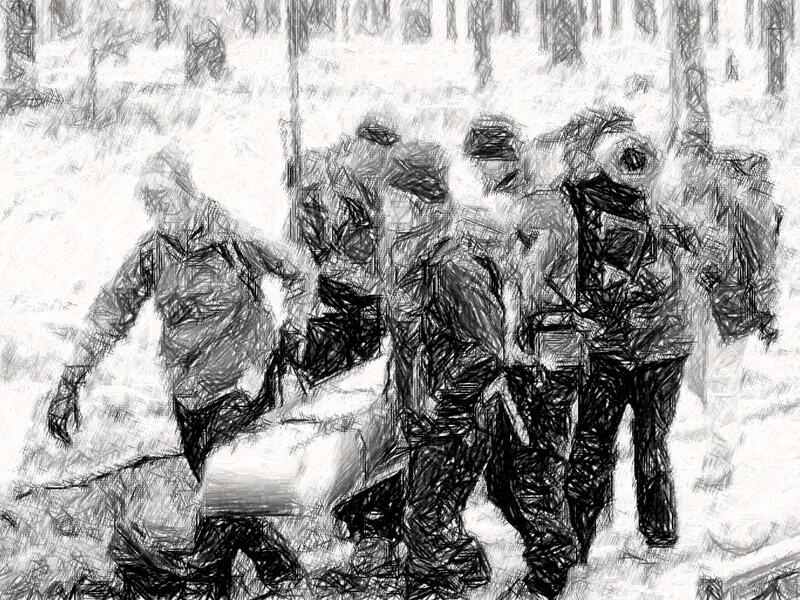 Backcountry First Aid, Buck Tilton. This book is $5.95 new from Amazon or a dollar or two used. Its also available at most outdoor stores including REI. We selected it because it was small in size, very inexpensive, and covered the basics needed for a weekend wilderness first aid course. You must purchase and read this book prior to class - we will be giving you a short quiz on the first day of class - just to keep you honest. For the medical professional: Medicine for the Outdoors: The Essential Guide to Emergency Medical Procedures and First Aid, Auerbach. If you have a medical background you'll appreciate the information in any of the books by Paul Auerbach, MD. I frequently use his Field Guide to Wilderness Medicine as a handy desktop reference (I usually have a medical dictionary nearby when I'm reading it). 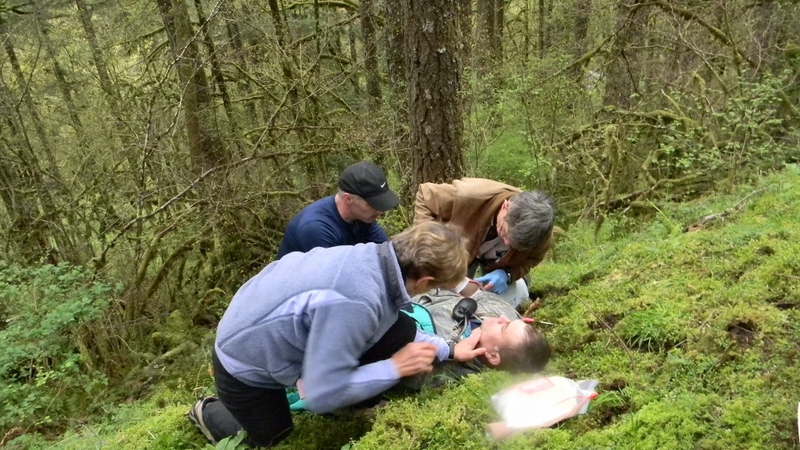 Also for medical professionals: Wilderness Medical Society Practice Guidelines for Wilderness Emergency Care, 5th Ed. This text is often cited as the standard of care for wilderness medicine. Other good wilderness first aid books for the lay person: Mountaineering First Aid by the mountaineers - This is a good text for a wilderness first aid course (We used it for this course last year.) Wilderness First Aid, Third Edition: Emergency Care for Remote Locations by AAOS is a nicely produced and illustrated work. Silver Falls State Park has cabins, and RVand Tent sites for those who want to stay at the park during the course. Some students have indicated they might want to share a tent site. There is no staying in the N Falls lodge overnight (Our training venue). The N Falls lodge is located in the group camp area but we didn’t reserve that camping option due to expense and limited amenities. The tent sites at the main campground are a few miles south of where we will be but have hook ups, heated restrooms and showers. The campground cabins are all full as of 2/21/12 but there may be rooms and cabins in the Silver Falls Conference Center (located within the park). They have cabins and meals: http://www.silverfallsconference.com/cabins You might just give them a call if the reservations link doesn't work. 866-575-8875. 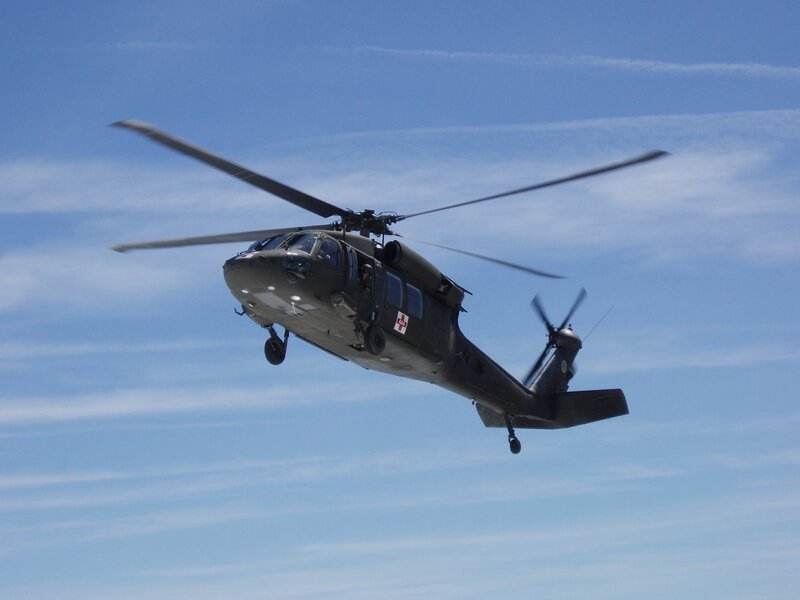 Carpooling from Salem: Meet at 6:30 am Saturday and Sunday at the State Motorpool on airport road and leave at 6:45 am. Amy Dale will be driving her Suburban. We may need other drivers. Carpooling from Silverton: Email Mike Niemeyer if you are interested in this option. We will leave from Silverton Safeway parking lot at 6:30 Saturday and Sunday. b. Slings and splints– includes practice. 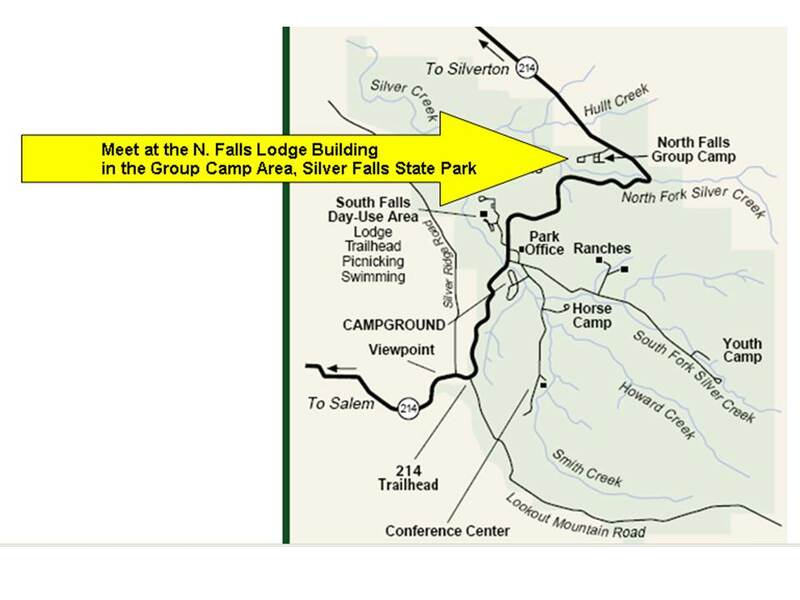 Training Location: Note that you will need a state park day use permit (NW forest pass does not work here) to park at the N Falls Lodge. You can get these permits at the automated machine in the parking lot at the North Falls trailhead which is about 1/4 mile past the entrance to the group Campsite - if you are traveling South on Highway 214 . This is also a good reason to carpool.